March 19, 2014 /1 Comment/in Foot Health & Hygiene /by Jenn F.
Each year, I visit my favorite local spa for a pedicure on my birthday. It’s not just a matter of personal hygiene. It’s about relaxing and pampering myself. It’s about wearing a plush robe, sitting in a dimly lit room, breathing in aromatherapy scents, listening to the sound of Asian mandolins, and enjoying a steaming hot cup of Aveda tea. A professional pedicure alleviates my cracked heels and calluses — which could become a portal to infection — and returns me to fresh, baby-soft skin again. Every time I go, I say, “I should do this regularly — like once a month!” While a writer’s salary is entirely livable, shelling out $60 for this self-indulgence every month gives me pause. That’s why I decided to do home pedicures and save a visit to the professionals for my annual birthday treat. DIY pedicures at home will save you money, but still give you that pampered, relaxed feeling. January 24, 2014 /0 Comments/in Toenail Fungus Treatments /by Jenn F.
We rarely think twice about throwing a pair of sweaty socks into the wash. But what about our shoes? Surely foot sweat and odor doesn’t end with our knit friends. 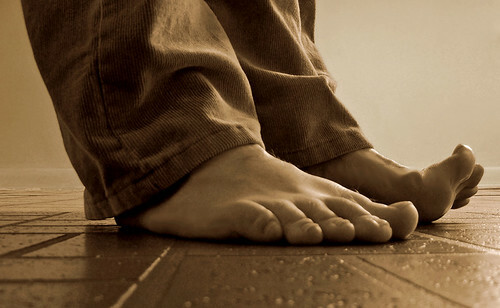 The barriers between foot, sock, shoe, and environment are thinner than we imagine. Shoe Care Innovations presents a safe, clinically-proven method of sanitizing the inside of your shoes with the SteriShoe sanitizer. This groundbreaking product is recommended by over 1,000 podiatrists and has been awarded the American Podiatric Medical Association’s Seal of Acceptance. If you’ve ever wanted a better way to clean your shoes and protect yourself from germs, read on to learn more! Inserting sanitization devices into your shoes for 45 minutes a day can kill 99.9% of the pathogens dwelling there.